Friuli is a wine region in the far north-eastern corner of Italy, its landscape characterized by coastal flatlands, mountains and plateaux. The region is bound by the borders with Austria and Slovenia (to the north and east respectively), which follow the contours of the eastern Alps. To the south lies the Gulf of Trieste (the northern tip of the Adriatic Sea), and the winelands of Veneto spread for miles to the west. 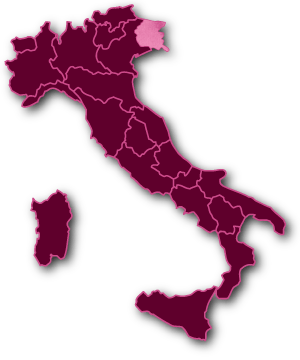 The region’s wines stand out noticeably from other Italian wines: they are made using mostly non-traditional grape varieties such as Sauvignon Blanc, Riesling and Pinot Bianco, but also some quintessentially Italian grapes such as Pinot Grigio and Friuli’s signature white grape Friulano which create classic example of these refreshing wines. Friulano was once known as Tocai Friulano but misleading associations with Hungary’s prestigious Tokaji wine prompted a change under international law. Friuli’s reputation as a wine region essentially depends on a select group of quality-conscious, small-scale winemakers. Proud of its idiosyncrasies and diversity, Friuli’s trump card is its mosaic of local grape varieties, although these are now increasingly being joined by international grapes such as Chardonnay, Pinot Noir and even the Bordeaux stalwarts Cabernet Sauvignon, Cabernet Franc and Merlot. In terms of terroir, the most important influence on Friuli’s vineyards is their position between the Alps and the Adriatic. The mountainous topography in the north and east lifts many vineyards above the low-lying cloud that is sometimes trapped between the hills and the coast. This allows the vines to bask in bright sunshine without overheating, allowing the grapes to develop full phenolic complexity and aromatic depth before their sugar levels peak. Lower down and closer to the coast, maritime conditions moderate the diurnal temperature variation and create more stable, reliable weather, offering local vineyardists the luxury of choice in their terroir.